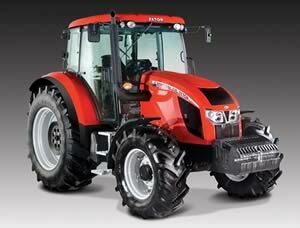 The Zetor Forterra 135 model with its new 16 valve engine is not only valued by experts but also users. To cite one example, Zetor received a highly positive review from American farmer, Mark Harper who appreciates its low fuel consumption. He tried the tractor out on a six-row zero tillage seeding machine for corn with a 600 litre tank for liquid fertiliser (1,2 kg/litre) and disc seeding girder brackets. Consumption amounted to 3.9 l/ha. During work with the Forterra 135 and till compactor with a stroke range of 3.6 metres, it subsequently consumed 13 litres per hectare which is an incredibly low figure in light of the fact that these machines have a large resistance and require a speed of at least 13 km/h in order to achieve a good quality result. Both of the two values measured are significantly lower than any former experiences this particular farmer had with other tractors. When put into practice therefore, it can be said that among tractors with a four-cylinder engine, the Zetor Forterra 135 ranks among the lowest and most effective consumer of fuel, without restricting its performance. The same results emerged from a highly demanding test which the German Agricultural Association (DLG) subjected this model to last year, where it received one of the best ratings. This tractor picked up great results in connection with fuel savings when it was proven that it is 5.7% more economical than the average of all previously tested tractors. The lifting strength, hydraulic performance as well as overall manoeuvrability of the tractor also came out well in the test. On its website, Zetor said, "Receiving such positive test results as well as ratings from actual users is crucial to us and we truly value them". Find out more detailed information about the Zetor Forterra 135 model, which thanks to the new concept, not only reduces fuel consumption but also boosts performance by almost 30 % and the torque by more than 47 %.